Glenn is a modern folded armchair convertible into a single bed with slatted base and resilient mattress. Also available with armrests and backrest. 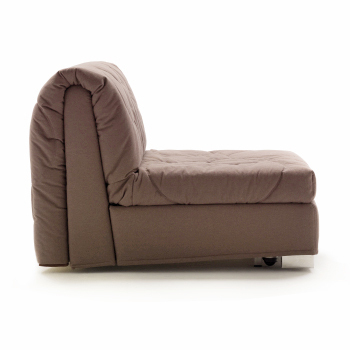 Glenn is a folded armchair bed with slatted base and a 190 cm high resilience polyurethane mattress. This folding armchair bed has an easy to use quick slide-out opening system: to open the folded resilient mattress you only have to slightly lift the seat and pull it towards yourself. The hidden casters make it easier to move it. Glenn is also available with armrests and backrest, in this case you can open it by simply pulling the seat toward yourself. The armchair backrest is fixed and becomes the single bed headboard. Its essential design and the original cover with circle quilting decoration make Glenn armchair bed the ideal solution for young and casual environments: in sitting rooms, bedrooms, guest rooms, or in kids rooms to accommodate your kids friends. If needed, the nice upholstered cover can be used as a quilt with 100% wadding padding. Glenn is available in two models: with armrests and backrest-headboard, or without armrests and without backrest-headboard. For more information download the mattress specifications. Glenn is covered in removable cotton fabric, characterised by a quilted circle decoration. It is available in several colours, all displayed in the samples page. When needed, the cover becomes a quilt for the bed. Mechanism or structure: high resistance furniture tube, oven coated with epoxy powders. Orthopaedic bed base. Mechanism opening in one time. Mattress: 25 Kg/m³ high resilience expanded polyurethane covered on the top with 100% cotton fabric quilted with 100 gr/m 2 resin 100% polyester wadding. 2,5 mm 3-layered interliner. Frame: solid fir wood and poplar plywood. Padding: interliner combined with mm. 10 expanded polyurethane. Cover: polyester/cotton bottom cloth, 100 gr/m 2 silicone 100% polyester wadding padding. Quilted cover: bottom cloth: polyester/cotton; padding: 200 gr/m2 resin 100% polyester wadding. Dry-cleaning. 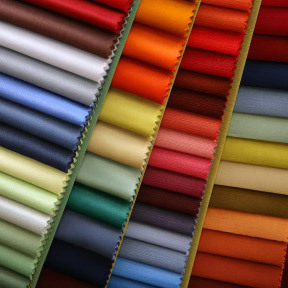 Fabrics: specifics in the samples page. Feet: naturally polished, wengé or cherry wood painted solid ashwood, chromed metal. Armrests and backrest-headboard (optional): frame: poplar plywood. Padding: 40 + 30 kg/m 3 expanded polyurethane, covered with interliner combined with 100 g/m² resin fibre. Tips: to open the folding bed you have to slightly lift it form the floor. The structure is equipped with hidden casters. Seating on the armrests is not recommended.